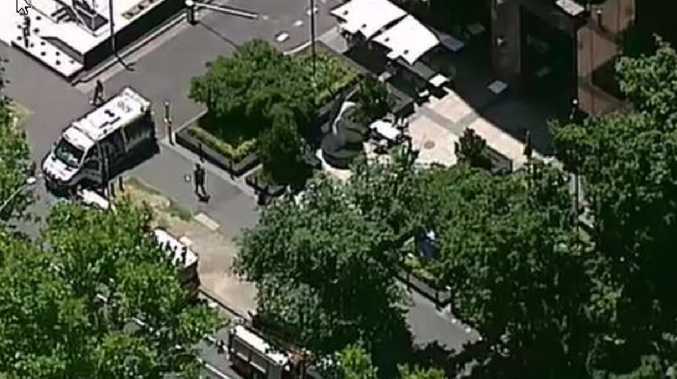 Suspicious packages have sparked a major emergency response and evacuation of some foreign consulates across Melbourne, with embassies in Canberra also hit. Diplomatic offices in Melbourne for countries including Germany, Italy, India, Spain and Korea were among those attended by police, fire crews and ambulance officers on Wednesday afternoon. "Police and emergency services have responded to suspicious packages delivered to embassies in Melbourne," an Australian Federal Police statement said. "The packages are being examined by attending emergency services. "The circumstances surrounding these incidents are being investigated." It is not yet known which embassies in Canberra have been affected. Two fire trucks, a hazardous materials vehicle and police cars attended the Consulate-General of India on St Kilda Road where staff were evacuated, telling reporters they had been told not to comment to reporters. They were allowed to re-enter the building, which was deemed "safe" by Vic Emergency by 3pm. BREAKING: Police and emergency services have responded to suspicious packages to embassies and consulates in ACT & VIC today (Wednesday, 9 January 2019). The packages are being examined by attending emergency services. The circumstances are being investigated. The Vic Emergency website lists more than 10 "hazardous material" events occurring across Melbourne, which began unfolding from about 1pm. Addresses for the events included Market Street, Bourke Street, Middleton Lane, William Street, and St Kilda Road in Melbourne, Elgin Street at Carlton, and Yertchuk Avenue at Ashwood. Each location matches the address of a consulate. Some of the events have subsequently been listed as "safe" and "under control". The Indian and US consulates on St Kilda Road as well as the British, Swiss and German diplomatic mission are believed to have been targeted. There are also reports the Korean, Greek, Italian, Pakistani and Egyptian consulates have also in lockdown. Unverified reports have said packages bearing the word "asbestos" and "wear a mask" were received. Earlier today Channel 7 reported seeing paramedics entering the South Korean government's offices. Two fire trucks, a hazardous materials vehicle and police cars attended the Consulate-General of India early on Wednesday afternoon, reported AAP. Vic Emergency has said 17 hazardous material incidents are in progress on St Kilda Rd, Collins St, Queens St, Albert Rd and William St in or close to the CBD and separately in Ashwood - all of which correspond to a consulate. At least eight vehicles are in attendance. Vic Emergency has said the incidents are "under control". Images have shown fire engines outside the consulates. The Metropolitan Fire Brigade is assisting Australian Federal Police, who is the lead agency in the investigation, an MFB spokeswoman said. The incidents come just two days after a suspicious white substance inside a parcel was found at the Argentine consulate in Sydney. Emergency crews in hazmat suits were seen entering the 44 Market Street tower in the CBD on Monday. A spokeswoman for Fire and Rescue NSW told news.com.au the powder was tested by crews at the scene and it is now in the hands of police.